Café Forty-One, tucked neatly behind the hustle and bustle of Queensway, is London’s first vegan French patisserie, and to coincide with world vegan month has launched its new Autumn/Winter menu. With features such as Alpine Ravioles and Pecan Praline Crème Patisserie, we sent one of our vegan contributors to dig their forks in. Step inside La Suite West hotel, and you are transported to a serene and sleek sanctuary, which houses the cosy Café Forty-One. The café is mixed with snug banquette seating, to more formal tables and lifted with natural light and floral arrangements to add to the plant based nature of the café. We are there for the set lunch menu which offers a main and elegant dessert for just £15.75. Forget pre-conceptions of vegan food that leaves you hungry or dissatisfied. The options on this menu are hearty, wholesome and sophisticated. I opt for their signature dish, Alpine Ravioles, which is a take on the French Alpes speciality which is traditionally filled with cow’s cheese. Our waiter tells us that their head chef, Clarisse, developed the dish using a vegan cheese to replicate the French classic. It is comforting and flavoursome, and for the non-vegans out there, I can guarantee you wouldn’t miss the dairy. My guest chooses the truffle polenta and wild mushrooms which is just as delicious and divine. But it is the desserts we are most excited to devour – we have been told that the head chef is known for her excellent vegan patisserie creations, and the menu reads like a crème de la crème Parisian patisserie list. 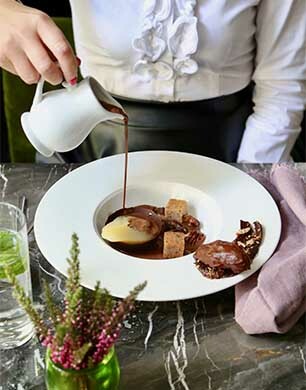 We share the Poire Belle-Helene – an indulgent dish of poached vanilla pear, sweet pecan praline, crispy hazelnut biscuit and topped with a dark and decadent chaud-froit chocolat ice-cream. It is a multi-sensory experience of crunch, stickiness, velvety soft flavours and fruity freshness. The quince and apple Tatin is moist, light and packed with autumnal notes from the redcurrants, apple and chestnut cream. Teamed with our turmeric lattes and loose leaf chamomile tea – we are in a state of utter pleasure. With our eyes set on the afternoon tea, but our stomachs full, we vow to make a venture back in the new year to try out their delicious looking afternoon tea – vegan scones and clotted cream! The vegan set menu will be running for the month of November, but they offer a vegan breakfast, lunch, afternoon tea, and dessert menu all year round. For more information and to book a table, contact Café Forty-One www.lasuitewest.com 020 7313 8484.